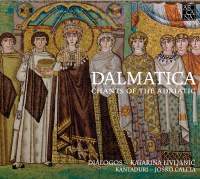 Dalmatica: Chants of the Adriatic is a exploration of the common origins and close intertwining of early chants through the Croatian tradition for performing Roman Catholic liturgy with vernacular (old Slavonic and old Croatian) languages, Glagolitic chant. The female vocalists of Dialogos perform music from the female monastic tradition and in particular their rendition of a troped Sanctus from a monastery in Zadar is absolutely mesmeric. The rhapsodic lines overlap, almost tumbling over each other in a moment of religious ecstasy. The contrast with the rich, impassioned voices of vocal ensemble Kantaduri in chants from local Croatian traditions serves only to enhance the beauty of each devotional tradition.